The user interface is via CW and I have not yet programmed it for beacon use. When I put it that service I can just move the chip over. We will see when that happens. So many interesting projects going on at the same time. This is a fun hobby! I saw the above video by Tom AK2B where he shows what he calls subway style of building. I wanted to try it so I bought a drill bit that is supposed to be used for wood and modified it a bit so that when making the 'islands' the drill bit will not go through the PCB. 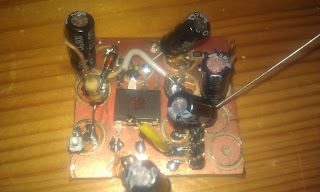 Below is an image of the latest project, an audio amplifier where I tried this. The image is taken in the middle of the build process so you can see some unused pads. BTW, the music is Motor City Drum Ensemble with Stuttgart Nights!